Galerie, Kirkgate, Newark as part of NewWork Collective - we have been working together to make an artists book based on the river Trent. 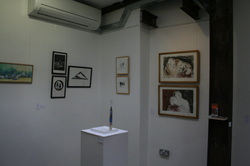 This show includes prints and film which explore the human condition. Elaine Winter has a range of prints and paintings for sale with prices ranging from £25-£300. Get in touch to discuss sales & commissions - please use the Contact page on this site.